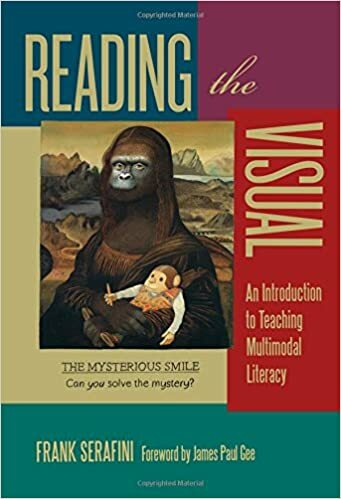 Someone, somewhere, in some space, mentioned Frank Sarafini’s book — Teaching the Visual: An Introduction to Teaching Multimodal Literacy — and, well, if that was you, thank you. I had reserved it through our library system weeks ago, and it has just arrived … and right on time for November’s Digital Writing Month adventures, too. I actually won’t do a full book review here. Instead, I have pulled out 30 quotes from Sarafini’s book that I will (try to) share one every day throughout November. Consider it a “slow book review” of sorts, where I hope my curating of Sarafini’s wonderful exploration of the changing world of writing and composition and the teaching of multimedia will inspire you, and me. We can get inspired, and what better month to do that and try our hand at digital writing, and share out our success and struggles and new understandings, than with Digital Writing Month, right? 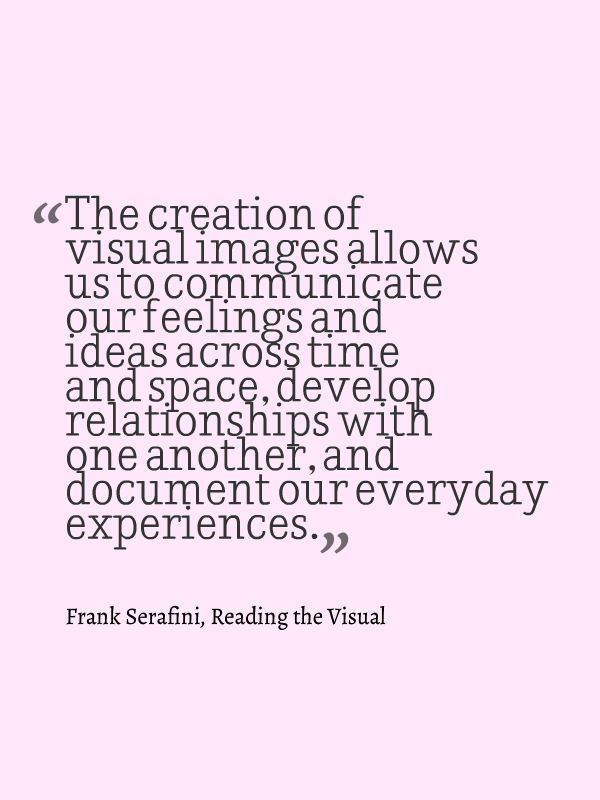 Sarafini looks at not just the visual, as the title suggests, but also the various elements of multimodal compositions as a means to help teachers move this kind of literacy practice into their classroom in a meaningful and practical way. I will be sharing the 30 Frank Quotes (I hope he doesn’t mind this informal name calling .. hey, I see he’s on Twitter, too. I will give him a shout out to join in DigiWriMo) via Twitter at the #Digiwrimo hashtag and in the DigiWriMo Google Community, and anywhere else I feel it might resonate. I will also be creating a collection over at Flickr. 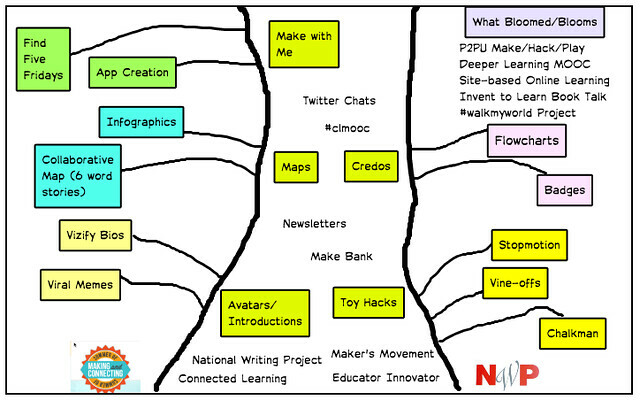 I am heading across the state tomorrow to the New England Council of Teachers of English to facilitate a three-hour session in hopes of bringing forth the ethos of the Making Learning Connected MOOC into a workshop for teachers unfamiliar with Connected Learning and the CLMOOC. 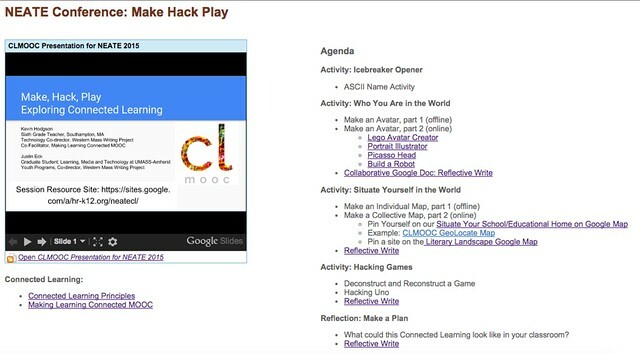 We’re going to make, hack, and play … to pull a phrase from Bud Hunt (and later, Karen Fasimpaur) that has become the title of my workshop at NEATE … with mapping activities, avatar creating and game hacking, all with a reflective stance on how Connected Learning might open up possibilities in the classroom for student learning and engagement. 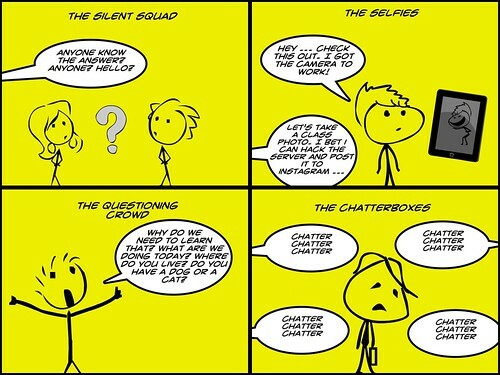 Bringing the ethos of an online community into a live space is sort of an unknown … but building bridges from the open learning from the CLMOOC and the principles of Connected Learning into a session where we can be doing things and creating connections is an exciting possibility. 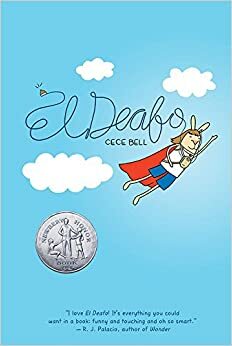 Cece Bell’s graphic novel, El Deafo, is a powerful example of how the storytelling possibilities of a talented writer/illustrator working in a graphic form can create a powerful response from a reader. If every that was in doubt, read El Deafo. Bell uses her own childhood loss of hearing, due to illness, as the hook to tell the rich story of identity and individuality, even as she brings the reader into the often-confusing world of growing up in an auditory world where you can’t hear everything that is going on around you. But Bell never lets her character or us, the reader, wallow in any pity or disconnect for too long, as CeCe, the character, shows her pluck and fortitude, as my grandmother might say, to make friends, to help teachers understand her hearing impairment, and to navigate through the use of hearing aids and lip reading. CeCe is patient and understanding, and willing to go the extra mile to be accepted by others for who she is. The moniker — El Deafo — refers to her exciting discovery that, as long as a teacher is wearing the microphone clip that sends signals to her hearing aids, she can hear “everything” that goes on (including times when the teacher uses the bathroom, bringing much humor to the book). Bell’s use of empty dialogue bubbles, or fading text, as well as even the animal-like characters that suggest Marc Brown’s Arthur series, are very effective here, on many levels. Bell brought me into the world of the hearing impaired in a way that none of the articles I have read nor none of the discussions I have had with hearing loss experts have been able to do. She humanized the experience, and in doing so, she made her character of CeCe a universal “kid” struggling to fit in while learning to accept and celebrate her differences. The “gearing up and getting ready” stage for Digital Writing Month is underway … with a sort of teaser, pre-writing activity in which we are encouraging folks to create an “unofficial CV/Resume” of what is really important. The title of the post is important: Your Story, Your Terms. The whole idea is try to turn the act of making CV with its narrow focus on our world of work on its head … by tapping into various modes and mediums, and using those elements to better express the person you are, in your own terms. What will your Unofficial CV look like? 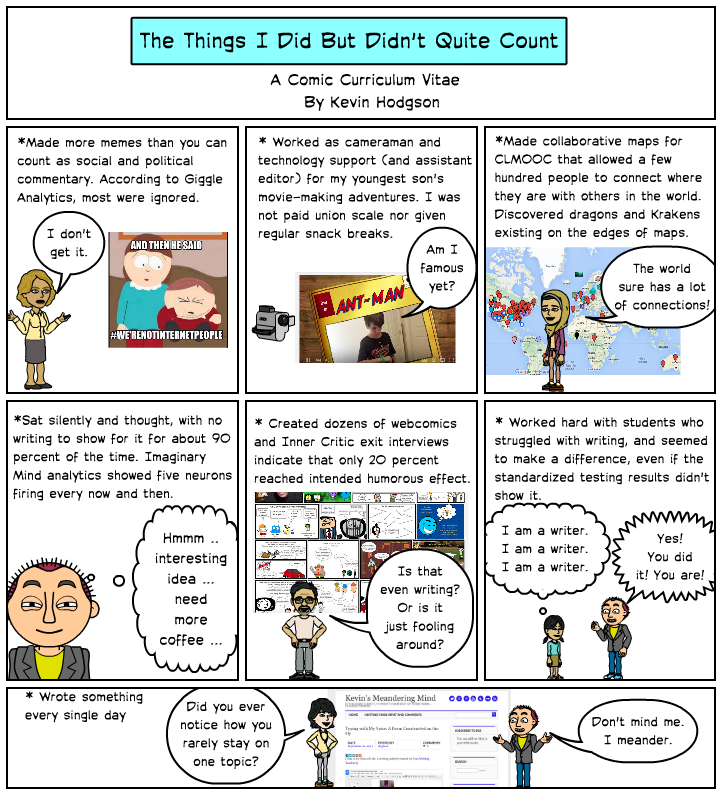 Come share it within and beyond Digital Writing Month. I’ve been giving my sixth graders a survey for a few years now on the State of Technology and Media in their lives. The results become the anchor points for conversations in class around technology and social networks and privacy and digital footprints. (This is for Slice of Life, a regular feature with Two Writing Teachers). My latest column at Middleweb is a humorous take on an ethnographic study of my four classes of sixth graders. I was trying to have some fun, even as I was thinking of the trends of class characters that can emerge after a few weeks of teaching into the new year. @Bali_Maha @sensor63 @dogtrax @NomadWarMachine @wentale How do you have the time given work and family? What is your WIIFM? I can only answer for myself and say, that as Maha noted in her own response, I find myself writing all the time: either in my head (knowing I need to remember that in order to write that down) or on paper (that scrap will do) or on various screens (although I find that using my thumbs to write takes too long and is very frustrating to the train of thought … my words feel like a caboose). Here’s how I end up finding ways and time to write: I stake out the morning. I get myself up early before my family (three boys, wife and dog) are all up and the house gets its crazy-time feel. I usually have about an hour or so before the day begins. I walk the dog, make my coffee … and sit down to write, either at my blog (the starting line) or in some other space. But I am writing in my head all the time, too. Years ago, when I was writing a long of songs, I used to walk around with melodies and lyrics humming in my head. I’d be lost in thought, literally, using my footfalls for rhythm, working out word choices based on rhymes and patterns and meaning. I still write songs, but not as much, and now, I find myself working out ideas around teaching and writing and art during the drive to and from work, while walking the dog, when waking up after sleep. It’s as if I have this huge invisible notebook and pen, and I am mentally jotting down ideas. For a long time at this blog, I was writing two posts a day. But even I knew that was too much for any reader. But I felt compelled to write, write, write, and so I did. Now, I try to focus a bit more on a single post a day, and some things just never get written. Not every idea is a good one, anyway. I’m not suggesting this all-day-writing-in-the-head works for anyone else. In answering Jeffrey’s query about writing management, I can only speak for myself: the words are coming all the time and I need my morning quiet time to write. When I don’t have that time, as happens now and then, I feel empty that day, as if the writing nourishes me. During a workshop at the Western Massachusetts Writing Project on collaborative writing and reading with Google Apps yesterday, I pulled out another version of my “Why I Write” collaborative slideshow as an opening activity, and it was a huge hit with the folks who attended my session. The slideshow theme was connected to last week’s National Day on Writing. Once again, I love the depth of the responses, and also, the ways that the slideshow allows many to write together on a single project, and then the ability to share that project out to the world. As an aside, it’s interesting for me to share the project because you (the reader of the file) can only see the slides themselves in my embeddable file above. But there is a whole set of comments and conversations that took place in the margins of the slides themselves as folks reacted to what others were writing (sometimes in real time, which was a cool surprise for many who had never used Google Apps for collaboration before). That’s another post for another time. At today’s annual conference for the Western Massachusetts Writing Project, I am presenting a workshop session around using Google Apps for Education for nurturing collaborative digital writing and reading skills in our students. Our key focus will be collaborative possibilities, and it will be a hands-on workshop. We’re gonna collaborate! 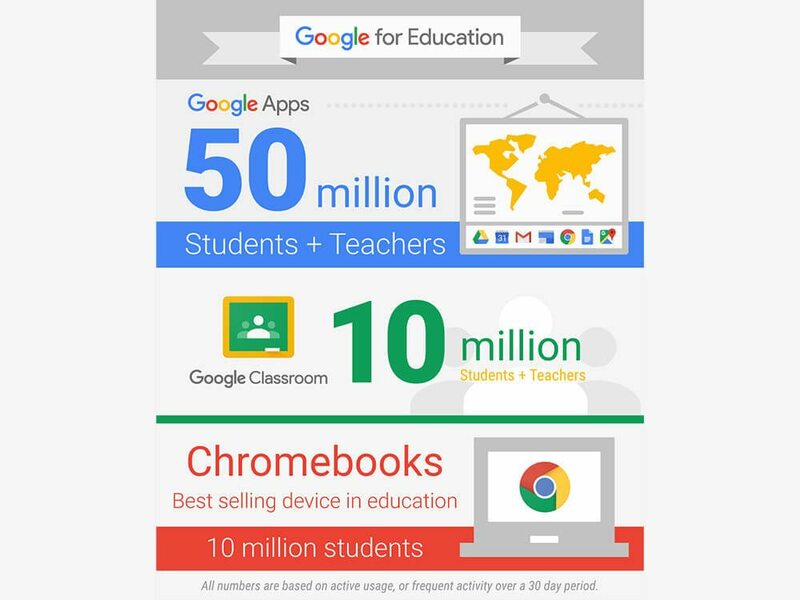 Google Apps for Ed now has 50 MILLION users in schools ..
Like Terry, though, I am hoping I keep a clear vision on the pros and cons of this development, and since I am no paid shill for Google (nor do I intend to be), I want to present some ideas in my workshop about both the possibilities and pitfalls of becoming a GAFE classroom or school. You can’t help but notice the way Google is insinuating itself into the fabric of education, with GAFE and cheap Chromebooks. Yes, there is a clear gain for schools and students accessing technology and possibilities in the digital age. But yes, too, Google is not doing it out of kindness of its heart (disregard its ‘Do No Evil’ mission — it has already dropped that). Google wants a Google Generation (sort of how first Apple got itself into schools with early computers and then Microsoft followed suit). Google is clearly playing the “long game” here: Start them early and make them Google for Life. 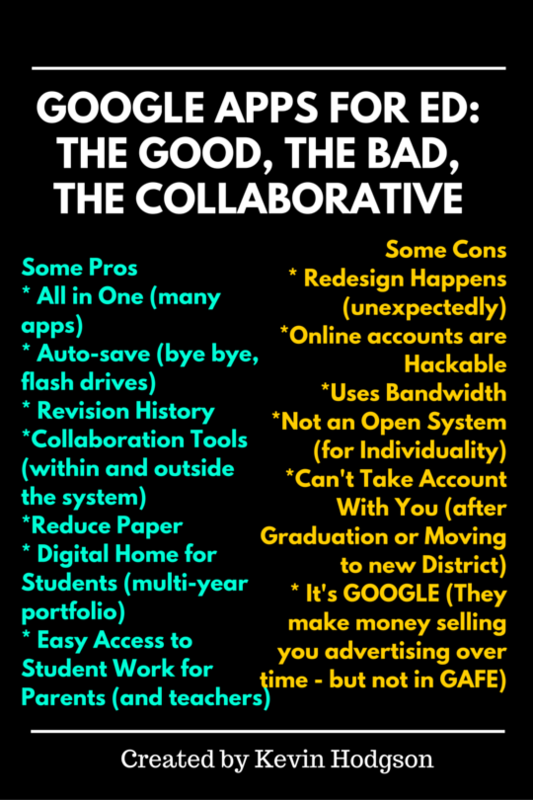 Here, then, is a list that came to my mind about how to balance the pros and cons of using GAFE in a school system. I am sure there are other ideas that I don’t even mention, and one that comes to mind already is the cost effectiveness of GAFE over other platforms. And cost is probably the reason most school districts turn to GAFE, and then justify it with the “pros” that I have list here. That’s my impression, anyway. The concept of “emergent ideas” has been on my mind this week through a few different lenses. First, I am planning out a three-hour Make Hack Play session for the New England Association of Teachers of English (NEATE) Conference next weekend, and the ethos of Connected Learning and the Making Learning Connected Massive Open Online Collaboration is driving my planning of the session. I hope to get teachers making things in a playful environment while also grounding the fun in Connected Learning ideas. 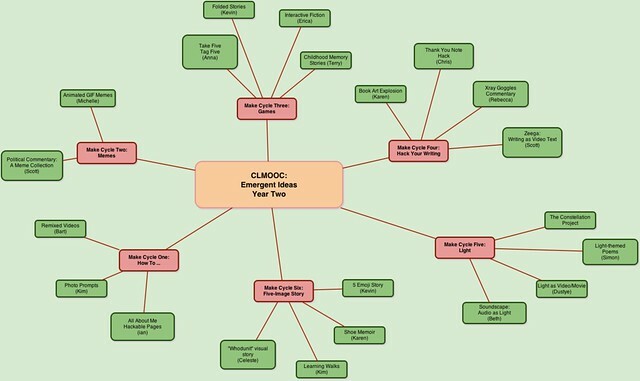 As I am pulling together an overview of the CLMOOC, and how one plans for the unexpected, the “emergent” projects that came out of left field and took on lives of their own, with little or only somewhat, guidance from the CLMOOC facilitators remains some of the more magical memories of that project. Then, in a podcast interview this week with Chris Guest about the upcoming Digital Writing Month, my co-facilitators Maha Bali and Sarah Honeychurch and I were talking about how we are working on a plan for November’s monthlong exploration of digital writing, but that we most fondly remember “emergent” projects and collaborations from other open learning spaces (such as Rhizomatic Learning) that formed the anchor of those experiences, for us, as participants. Our hope is that all sorts of emergent ideas bloom in Digital Writing Month, but how do you plan for that? First of all, you can’t. If an idea is open, then open is the idea, and facilitators have to keep the hands off the wheel as much as possible. But facilitators can establish fertile ground for ideas to take root, and facilitators can “notice” these ideas and gently move them along. Facilitators can validate what might seem like a crazy idea and see it can work. Facilitators can become the conduits for collaboration. 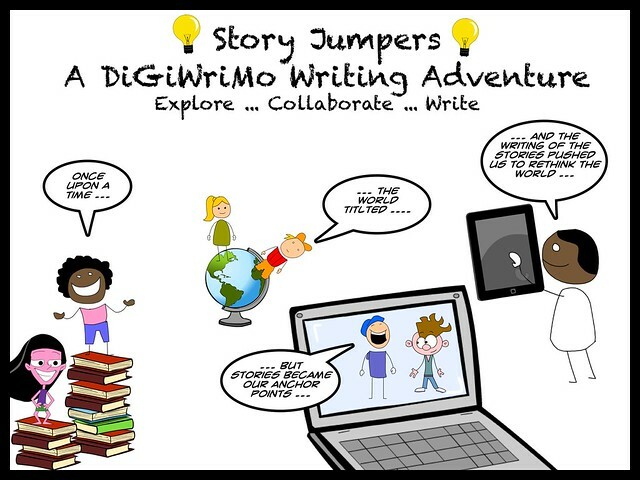 Here’s an example already with Digital Writing Month, and the month hasn’t even begun (it takes place in November): the Storyjumpers Project. It began with a tweet from Bruno, who was thinking of signing up for Digital Writing Month, and then after doing so, he wondered out loud, on Twitter, if a collaborative story, moving from blog to blog, might be possible. That was all we needed, and soon, we had an open Google Doc up and running, and now 18 people (including a youth writing group in Vermont) from all over the world (literally) have signed up to “pass the story” throughout Digital Writing Month, from blog to blog. To be honest, we don’t know how it will unfold, and whether there will be chaos or beauty, or something smack dab in the middle. But that won’t stop us from trying this kind of collaborative writing adventure. There’s a story to write, and we’re going to write it. Meanwhile, Maha and Sarah and I wonder what will emerge next in Digital Writing Month. Who knows? I’m a facilitator and I have no idea. And I am fine with that. Expect the unexpected, and learn more about the world. That’s how learning takes root and flourishes. 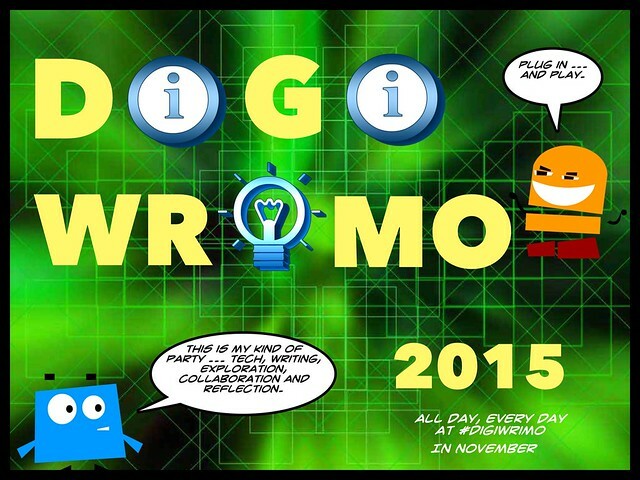 Want to know more about Digital Writing Month?